Ever wondered what would happen if there a battle of ben 10 vs ben 10 aliens themselves? Well, if you wanna know then you must play Ben 10 Duel of Duplicates Game! With Feedback, Snare-oh and Bloxx, Ben 10 must save the Plumbers base from duplicate aliens. 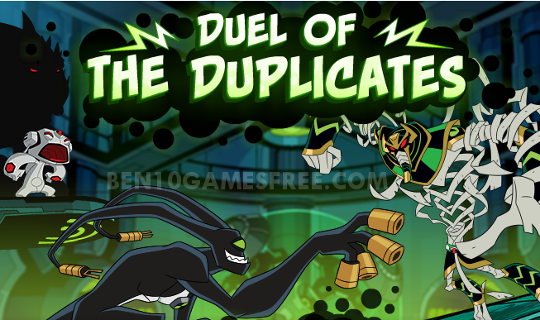 Ben 10 Duel of Duplicates game features the aliens from the popular Ben 10 omniverse tv series. The game is set in the Plumber’s base which is attacked by evil aliens who are duplicates of Ben 10 aliens. In other words, in this game, Ben 10 aliens are fighting against themselves. The Plumbers are under attack and if a single evil duplicate alien remains alive, no one is safe. Talking about the game play, Ben 10 Duel of Duplicates has four main stages. Each of the stages is fought in a different area of the Plumber’s Base i.e. Engineering base, Armory base and Power Core base. The mission is to find your way to the next base in each level. The very first level of Ben 10 Duel of Duplicates game has Feedback on the mission and you have to guide him to reach the duplicate Snare-oh in the last. As you move through the Engineering base, evil duplicate Echo Echo will attack you. Get rid of them using the Plasma attack of Feedback. After completing each consecutive level, the duplicate alien you defeated will be added to the Omnitrix. And you can use them in coming levels. Pro Tip: Collect as many Omnitrix badges and Power drinks as you can to stay alive for longer. In the final level, the battle is against the most powerful Ultimate Humungousaur and once you defeat him, the Plumbers base is secured once again. Now, it’s time for some action. Remember whatever you read and win it all. With Feedback, Snare-oh and Bloxx, Ben 10 must save the Plumbers base from duplicate aliens. Good Luck!! Don’t Forget to give your rating for Ben 10 Duel of Duplicates game and share your tips and tricks to win this game in the comments section below.